Inline skates can be your best friend in many ways. Exercise is only one of them. “Skating is just as aerobic as running, but with very little impact, so you get the same advantages as running without stressing your joints,” says Derek Parra, 2002 Olympic gold and silver medalist in speedskating. 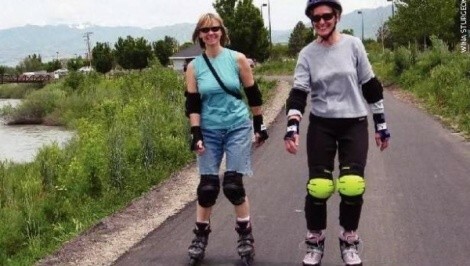 “You can use inline skates to commute. They’re a great form of transportation. You can get your heart rate up by increasing your effort—or by being terrified,” he says, laughing. Parra started on inlines, and became three-time World Champion before switching from wheels to ice blades. He says the only thing keeping most people from becoming inline experts is lack of confidence. Parra suggests beginners build confidence by working on balance and control first. “Learn to march on your skates, so you get comfortable standing on one skate at a time. Then begin moving forward with one-legged gliding. Keep your upper body centered between your skates, not leaning forward or back. If you feel more comfortable using a pair of ski poles to help your balance, do so,” he says. Stop by turning one foot sideways, pressing the wheels down hard and dragging them. This is a T-stop, and it can also be used to control speed. A good skater is able to stay upright when rolling over obstacles like a twig, stone or cracked pavement. That skill starts with an athletic posture: flexed at the knees and hips to react instantly to changes in balance. On sand, gravel or debris, the best thing to do is to power through. When it’s something big, like a tree branch, jump over it. (This will take some advanced practice). Falls happen. Know your enemy. “If you’re falling, the worst thing you can do is try to prevent it, because you’re already past that point. The best thing to do is just roll with the fall. Roll from your shoulder to your back, so your body parts touch the pavement only briefly. If you freeze or tense up, you’ll hit hard and slide, getting road rash,” Parra advises. Once you’re confident enough to get some speed, practice jumping. Jump on and off curbs from a stop, then try it while skating to improve your timing. Jump over sticks on the pavement until you feel confident doing it. Parra, who just became head coach of the U.S. all-around speedskating team heading into the 2010 Olympics, says there is an abundance of great places to skate. One is the miles-long Jordan River Parkway, well-paved and scenic. He also recommends SugarHouse Park and Liberty Park. Another is the Legacy Highway Route, which parallels the Legacy Highway. One of the best things about being able to skate is that it lets you avoid the frustration of finding a parking place in downtown Salt Lake City. While others are circling downtown looking for a slot, you can drive further out where spaces are plentiful, and often free. Put on your skates, slip your shoes in a backpack, and skate to your destination. Change back into shoes, stow the skates in your pack … and try to avoid feeling superior and smug.